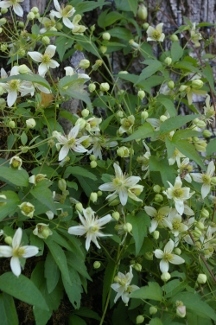 Joy Creek Photo Archive (c) all rights reserved This interesting cross between Clematis ligusticifolia and C. serratifolia was developed by Frank Skinner of Manitoba, Canada in 1925 as part of a breeding program to develop clematis that would be hardy in the northern plains. Although small, the creamy, four-sepaled flowers of Clematis 'Grace' are produced in great abundance throughout the growing season. The flowers open wide revealing contrasting red-purple stamens. For those that need a hardy but not too vigorous vine to cover a fence or trellis, this is certainly an excellent choice.All of our Clematis are two year old plants that are suitable for immediate planting in your garden. July to October. 10-12 ft.
To keep this in scale, cut this back to two or three feet at the end of winter to promote new growth. Be sure to fertilize after pruning.